So these babies arrived in the mail recently -- the advance uncorrected proofs for TAMER OF HORSES. And I'll be giving just ONE away on goodreads, so keep your eyes peeled for information about that next week! Final copies with the final finished Lane Brown cover art are next, once I make sure everything is as clean as I can possibly make it! And if you'd like to follow along with my proofing for both TAMER and DAUGHTER OF A THOUSAND YEARS, I'm posting updates with commentary on goodreads pretty much daily! And now I'm back to work! 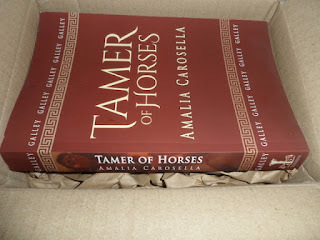 Those of you already following along on Goodreads know I've been (hopefully) final proofing TAMER OF HORSES, and one of the things I love to do is work in small nods to pieces of mythology that aren't part of the immediate narrative I'm retelling, and because it's my birthday, I thought I'd share! This is one of those small moments which takes place shortly after Hippodamia and Pirithous meet. She's still pretty unsure of him, and I'm pretty sure you won't blame her for it! Pirithous is... very Pirithous. He had thought of everything, and now he held her hand, it was clear he had no intention of letting her go. Her fingers twitched, but he only threaded her arm through his, smiling down at her as if he did not hold her trapped at his side. And those of you wondering -- the cover art went out YESTERDAY to newsletter subscribers, and you can pre-order it NOW for kindle!